After lengthy research, I have managed to throw some light on the mystery of the life of Antoinette Flegenheim. Berta Antonia Maria Wendt was born 11 May 1863 at 8 a.m. in Himmelpfort near Fürstenberg on the Havel, the child of Wilhelm Karl Ferdinand Wendt, an assistant royal forest keeper , and Pauline Anna Dorothe, née Wagner. She was baptized on 7 June 1863 by Protestant minister Brühl4. In the Brandenburg State Archives in Potsdam I found a reference to her father. He had been asked to be a witness for the inauguration oath of a forester.5 His handwriting seems to be that of an educated man. It is remarkable that an assistant forester should have been asked to bear witness at such an important ceremony. A sister, Anna Elisabeth Hermine Wendt, was born on 24 February 1871 in Berlin and was baptized in the Luisenstädtische Kirche on 2 July 1871. The mother gave birth to the child in Annenstraße 10 in Berlin-Mitte. The father was the royal forester in Heydemühle.8 One can assume that the father was sent as a civil servant to Heydemühle. In former Prussia, there were several forestry offices with similar names. Most likely, Heydemühle in East Prussia near Allenstein was meant.9 Prussian civil servants were subject to instruction and had to go where ever they were sent. Probably his wife gave birth in Berlin, either with a relative or a midwife. It seems she lived in Berlin and must have met her future husband Alfred Flegenheimer there. Alfred Flegenheimer, born on 28 December 1869, came from a Jewish family from Frankfurt on Main.14 Alfreds brother, Helmut, was one of Germanys movie pioneers (15). Helmut travelled in 1898 to the U.S.A., probably to visit his brother Alfred. At immigration Helmut gave his Frankfurt address. His wifes first name was Berta. She later emigrated with him to Great Britain and became naturalized in June 1938. Her address then was 6 Dorset Court, Dorset St., London W1.16 Helmut too changed his name, from Flegenheimer to Flegheim and then to Fellner. 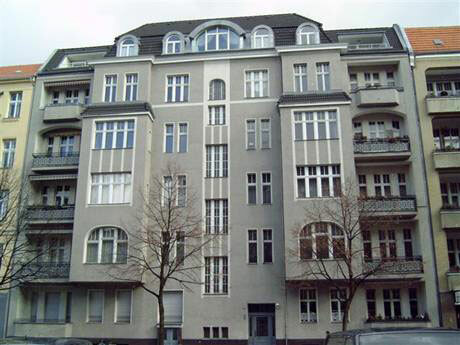 The mother-in-law of Antoinette Bertha Flegenheimer came to Berlin with her sons and lived in a wealthy area in Regentenstraße 2. This street does not exist anymore. It was situated on the edge of the large Tiergarten park area, where the Museum of Decorative Arts on Tiergartenstraße is now located. Antoinette later reported on her complaints to the ships management, as, for example, the electricity failed and, with it, the heating in her first class cabin. It is interesting that she stated that William Greenfield arrived with another young man from Cologne (it was probably Alfred Nourney, his card-playing partner) and they urged her to get dressed as soon as possible and to come on deck. She did so and also took some money from the cabin. She wanted to collect her valuables from the head pursers office, but it was closed. Because she had not put on a life jacket, another passenger gave her one and an acquaintance, Henry Blank, who had just joined her, told her to put it on so as to keep warm, as it was freezing outside on deck. Antoinette had survived. The New York Herald reported on 19 April 1912 that she did not want to make any comment after her arrival in New York, as, in her boat, a sheet of paper was handed around asking them not to say anything about the disaster after their arrival in New York and she felt bound by this. A steward had called all ladies to the port side, but as a door opened to the starboard they all went to this side of the ship and officer Murdoch, who was present there, had prepared the first boats. She spoke about the noise of the escaping steam and said that she nearly lost her hat, which was given back to her graciously by Murdoch. Without any haste they  about 30 people, women and men had got into the boat (it was boat no 7 which was the first one to leave the ship) and were provided with rugs. She expressed the opinion that the crew in charge of the boat were inexperienced and had difficulties in loosening the ropes, when they touched the calm sea surface. It was only when they saw the fully illuminated ship with her bow already underwater that they realised how dangerous the situation was. It was a surreal spectacle. After the sinking, the screams of the victims were heart-rending and unbearable. Mrs Greenfield had to cover her ears. The young man from Cologne had the foolish idea to shoot off all his revolver cartridges (God knows why). Antoinettes age on the marriage certificate was 42 years. As profession, none was noted. She did not have to work; she was, after all, a rich widow! The birth-place indicated is Germany  followed by an unclear word in brackets (Himmelfort)31. Her father was given as Wilhelm Windt (sic). 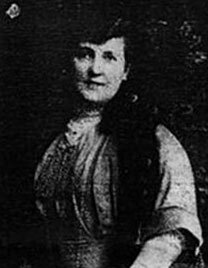 Her mother as Pauline Wagner. 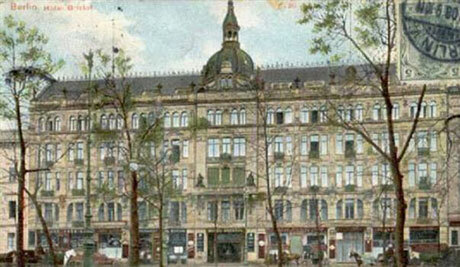 On 24 December 1912, Antoinette from her address in Charlottenburg, Windscheidstraße 41, filed a claim for lost items. She stated she had twice tried to collect her valuables from the ships safe in the Head Pursers office, but found nobody on duty at the desk after the collision. Her claim filed with the U.S. District Court for the Southern District of New York, gives her name as Antoinette White-Hurst (formerly Flegenheim). She herself signed the claim as Mrs P.E. 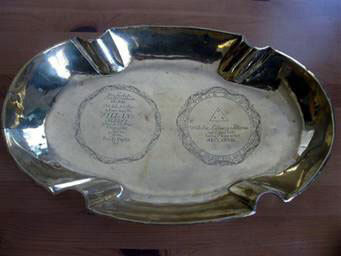 White-Hurst formerly Mrs Antoinette Flegenheim. The loss she claimed was $3.682,00 for wearing apparel, etc. and $14.707,00 for jewellery (mostly diamonds) and cash. To explain the situation, it must be pointed out that Antoinette had married before WW I had started and had automatically acquired British citizenship and lost her American and/or German status. This is the reason why she had do leave Berlin. 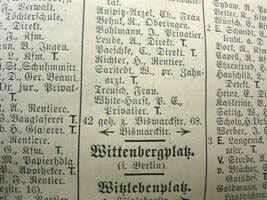 Her last registration at Windscheidstraße in the Charlottenburg and Berlin directories was under her name Whitehurst and not Flegenheimer and was in 1913. During WW I, Whitehurst worked with the British war office as a translator in the intelligence department. In his war record from 1915 it says there is nothing known to the detriment of the officer except he has a German wife.30 In the document it is also mentioned that his wife, Antoinette Whitehurst, had since 1914 lived in The Hague, the Netherlands, was associating with suspects (times of war!) and was a friend of Count Bylandt. Otherwise, the personal record gave the husband of Antoinette a good character reference. Originally I had assumed she was Jewish because of her first husband. This is not correct. The Jewish community in Berlin had no trace of her, nor even of her first husband, who could have been a secular Jew. He might have been a convert, but a search of the Protestant church archives was also fruitless. A search of the internet for links between Harriseahead and Stafford and the family name Whitehurst brought a number of results. Usually they were of mine-workers, belonging to the, in the locality, majority Wesleyan confession. But Jane Lowe told me the parents of Paul Elliot were strict Methodists and that his father worked in an insurance company. A note from the City archive of Munich was a pleasant surprise for me. The director informed me that Antoinette Whitehurst, born on 11 May 1863 in Himmelpfort, had lived until 1938 at Nibelungenstraße 90 and had left the city without deregistering, possibly in 1939. I was also informed that Nibelungenstraße 90 today is Arnulfstraße 300 and due to the bombings during WW II is not recognisable any more. She was registered as living at Nibelungenstraße on 24 March 1923, at Menzinger Straße 17 (today 71) on 20 September 1938 and finally on 10 June 1939 at Kaulbachstraße. She did not de-reregister and it is possible that, as she was a British citizen, she left the city and country at the beginning of WW II.35 I have enquired if she might have died in Munich and was buried there, but this is not the case. There, I have again lost track of her. I tried to find out if she went to England to her brother-in-law Fellner36 or to the U.S.A., but failed to find any evidence. In 1939, she was already 76 years old. In the passenger list of the Suevia in 1890, there is no exact date of birth, only the age of 22.This means she would have been born in 1868. At the registry office in The Hague, where she lived as Antoinette White Hurst, née Wendt, the date of birth is given as 11 May 1868. 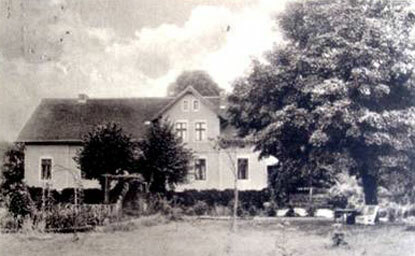 The Munich registry office says she was born in Himmelpfort on 11 May 1863. The New York census (Manhattan) says she was born in May 1871. 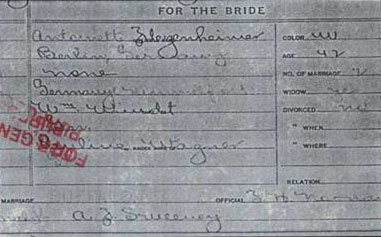 The marriage certificate of 1912 in Buffalo shows an age of 42, which means she was born in 1871. Encyclopedia Titanica gives her age at the rescue as 48.34 This means she was born in 1863. My conclusion is that it is interesting to see that twice her birthday is given as 11 May and in the Manhattan census as May. The parents in Himmelpfort were Wilhelm Wendt and Pauline, née Wagner  also mentioned in the marriage certificate of Buffalo. Since in both marriage certificates and in the census, the year 1871 is given, it is quite possible she has made herself younger. Due to the lack of personnel for registration in the U.S.A., this was not too difficult to do. It is quite certain that it is the same person. I am also fairly certain that it will be possible to find out when and where she died. Biography of the Encyclopedia Titanica, she is called, as is practice in the U.S.A. Mrs Alfred Flegenheim. William L. Walker, New Windsor, NY  Newburgh Daily News, 26 April 1912: SawSurvivors leave the ship. Voyage Elusive passenger pens story. Daniel Klistorner and Charles Provost. Retired pastor Erich Köhler, Fürstenberg-Bredereiche. Now in Poland, unfortunately there are no documents available. Census of the Grand Duchy of Mecklenburg-Schwerin of 1 December, 1900. 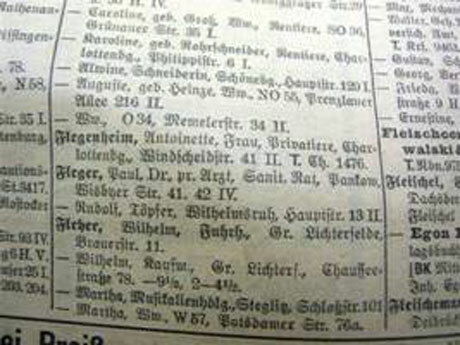 Hamburg passenger lists 1850-1934 and Castlegarden.org. At the marriage with her second husband Paul Elliot White-Hurst on 20 June 1912 in Buffalo, NY, she gives her age as 47, which would imply 1865 as the year of birth. For the journey on board Kaiser Wilhelm II (arrival according to New York passenger lists on 3 October 1905), she states she is 36 years old, which means she would have been born in 1868. According to the Jewish Museum in Frankfurt on Main. He called himself Helmut Fellner, according to the exhibition at the Centrum Judaicum in Berlin Pioniere in Celluloid his Frankfurt address was Wöhlerstraße 8. He emigrated to England and committed suicide. New York Tribune, 28 February 1902. Geoffrey Stein, Albany  former first historian of the New York State Museum. 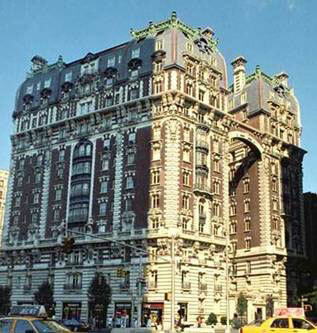 The address given is Manhattan 170 W71. Marriage contract Manhattan 13072 according to research of the internet site of the Italian Genealogical Group New York  the name of the husband appears as Alfred Fligenheimer and that of the wife as Tony Wendt! According to Kasstor it shows there is again a relationship to the film and theatre world  as also by her brother-in-law and her sister. Documents from Ellis Island research. Obituary in the New York Times of 24 November 1907. Article by G. Schmidt-Grillmeier in Navigator: Berliner Niederlassungen der White Star Line, No. 55, May 2011. Newburgh Daily News, 20 April 1912  according to the statement of the befriended couple Walker. In boat 7 there were, according to Antoinette Flegenheim, not less than 50 people. Actually there were only 28, including the silent movie star Dorothy Gibson and the Frenchmen Alfred Fernand Omont and Pierre Maréchal (their story was printed in Latitude 41 No. 44/45/2010  the magazine of the French Titanic Society). Article and interview for a catalogue of the Albany Institute for History and Art, where she talked, on the occasion of a vernissage for which she had contributed some pieces of art. In spring 2008, Daniel Klistorner and Charles Provost published an article in Voyage which appeared on 23 May 1912 in a magazine entitled the N.Y.A.I. Catalogue. Berliner Lokalanzeiger, 20 April 1912. Marriage certificate, which was mailed to me by Jane Lowe the grandniece of Paul Elliot Whitehurst. She gave valuable information about him. This part of the document was examined with the help of graphologists of a genealogical society. They all came to the same conclusion: Himmelfort or Himmelpfort. Registry office of The Hague/Den Haag  information from Jan Willem Kooistra by mail dated 7 August 2011. Himmelpfort at this time belonged to Templin county. Encyclopedia gives her age at the time of the sinking as 48, which corresponds with her real date of birth, i.e. 1863. Archive director Hans-Joachim Hecker by mail on 5 August 2010. Hermann Fellner was mentioned in the book by Gerald Ramm Als Woltersdorf noch Hollywood war. H.F. was partner of the well-known film-maker Joe May (Josef Mandl from Vienna). Hermann had to leave Germany after the National-Socialists came to power and died by suicide in 1938 in England.